Omise WooCommerce is the official payment extension which provides support for Omise payments for store builders working on the WooCommerce platform. 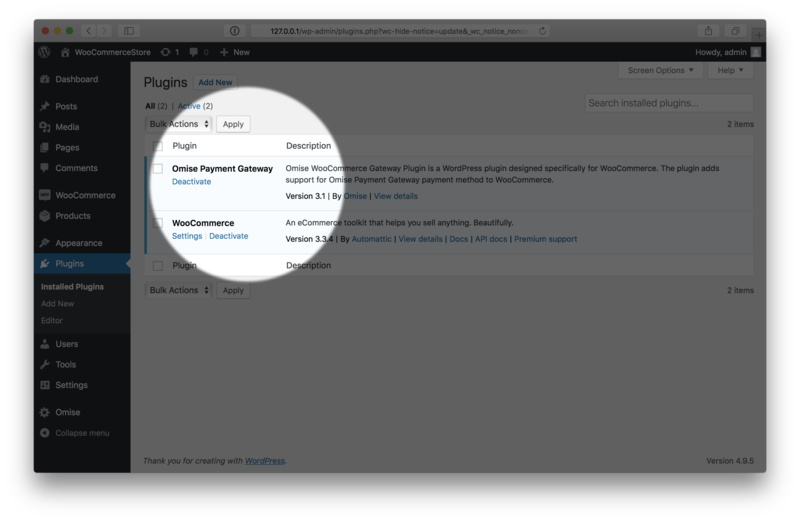 WooCommerce version 3.3.4 and above (tested to version 3.5.7). The extension doesn't work on your version? We want to be supporting as many versions of WooCommerce as we can. If the version you are currently working on has not been tested on, you can test it out, and if you face any issues please let us know on GitHub's issue channel by following the "Reporting an issue Guideline". 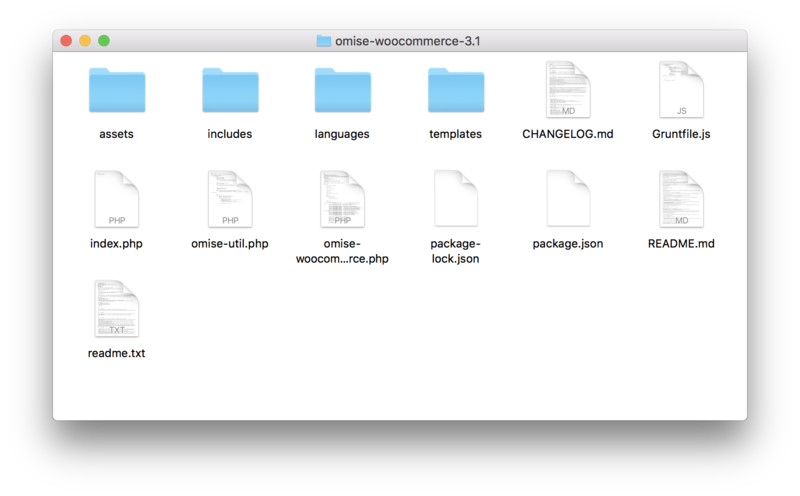 To install the Omise-WooCommerce plugin, you can either manually download the plugin from this repository and install it or download it via the WordPress Plugin Store. Download and extract the zip file from Omise-WooCommerce to your local machine. 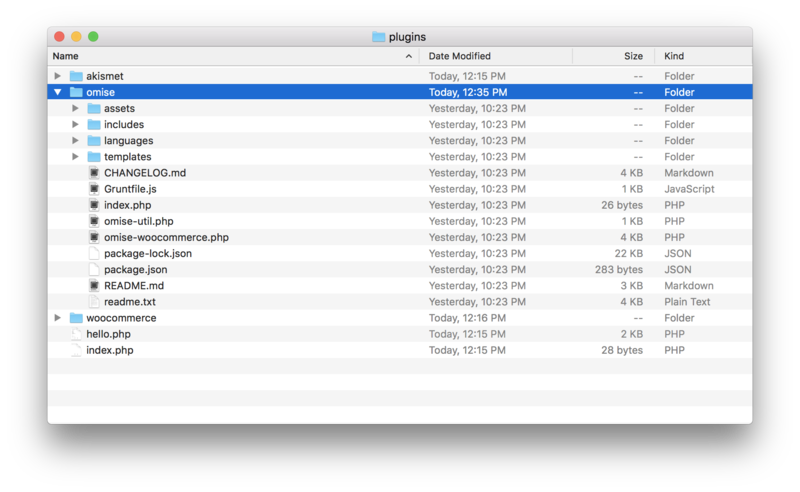 Copy all files from step 1 to the WordPress plugin folder, your-wordpress-dir/wp-content/plugins/omise-woocommerce-3.3. Once done, you will find Omise Payment Gateway on the Installed Plugins page. Click activate to activate the plugin. You have now completed the installation process. Next, check First-time setup to continue setting up your Omise account with your WooCommerce store. Once you have installed the plugin, next up is to connect your store with your Omise account, and enable your preferred payment methods.This will enable your customers to make payments on your store through Omise. 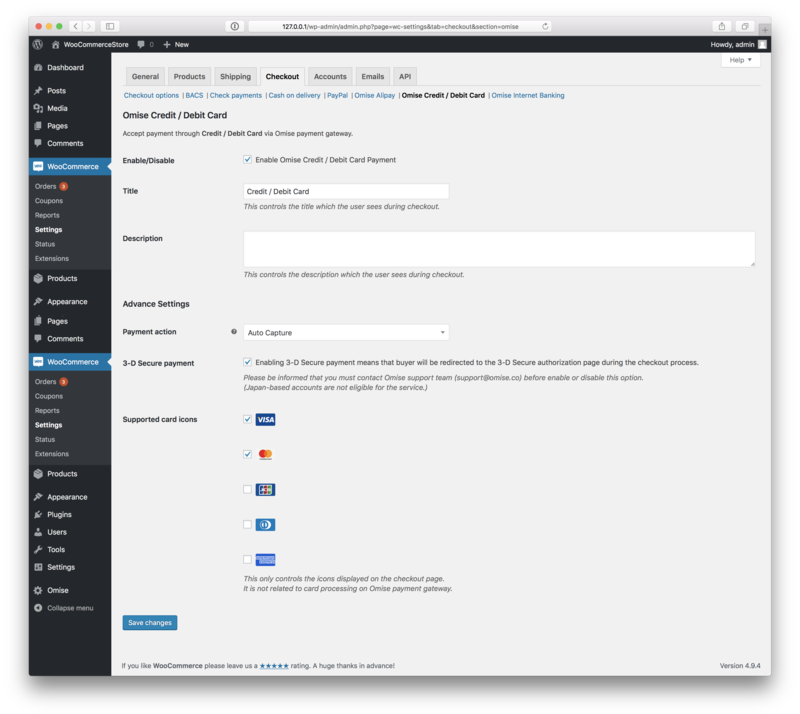 Log in to the WordPress admin page. From the sidebar, go to Omise > Settings. Here, you are going to set your Public key and Secret key (these keys can be found in your Omise Dashboard). If you would like to test out the integration before going live and receiving actual payments from your customers, make sure that Test mode is checked, and that you are using the Public key for test and Secret key for test. 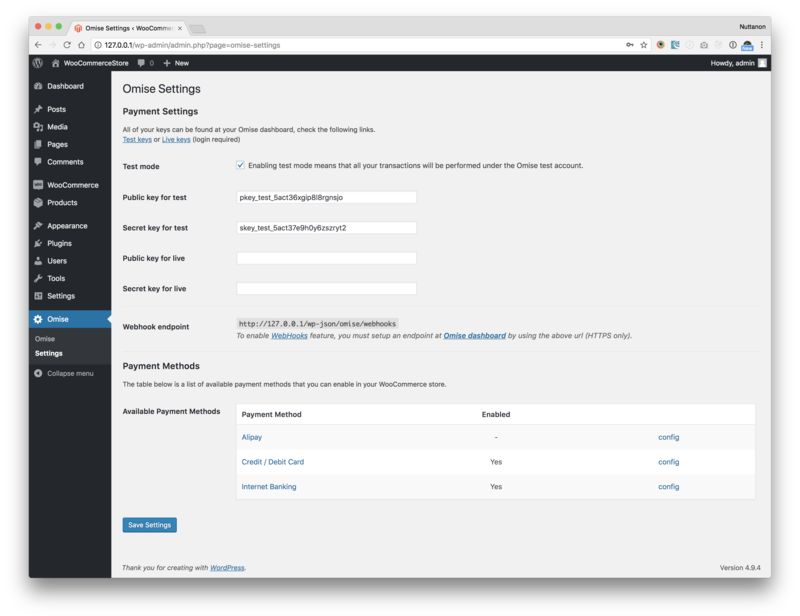 The plugin currently supports 3 payment opitions; Alipay, Credit / Debit Card, and Internet Banking. Note that Alipay and Internet Banking are only available for merchants with a Thai-registered Omise account. On the Omise Settings page, under Payment Methods, you will find the 3 available payment methods shown on the list. 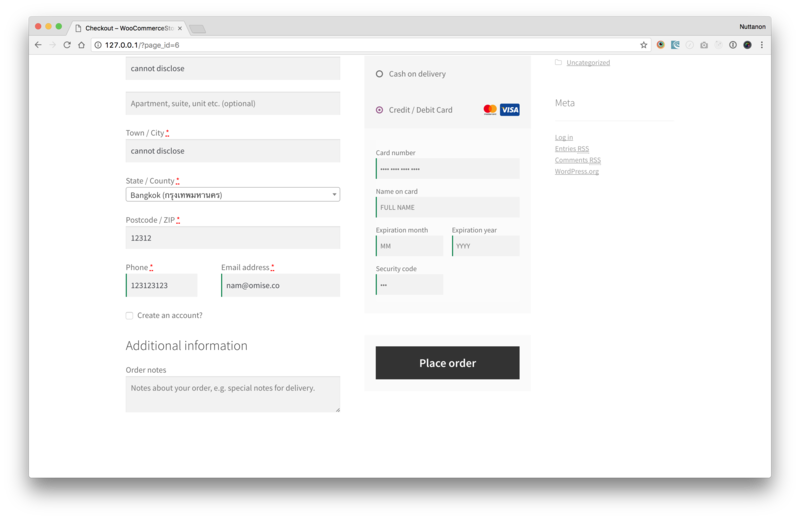 Click config at the table on a payment method that you would like to accept payment with. The screenshot below shows the configuration page for Credit/Debit card payments. The configuration page varies depending on the the payment method selected. At the configuration page, check the Enable/Disable field. You may also choose to change or update any other option on this page (optional). Click 'Save changes'. Once done, the payment methods you selected will be available at your checkout page. To learn more on how to create a charge, issure a refund, or any other details about the plugin please check the Omise-WooCommerce's Wiki. We look forward to hearing from you, and are willing to review your changes. Please follow the instructions in the links below if you would like to submit changes and/or issues. You're all welcome to submit a pull request. Please consider the pull request template and fill out the form whenever you submit a new pull request. Please submit your issues through GitHub's issue channel. Omise-WooCommerce is open-sourced software released under the MIT License.